While the Cub Scouts Good Manners Belt Loop has been retired, the Scout Law reminds us that a Scout is courteous. These good manners activities are perfect for the Tiger elective adventure, Earning Your Stripes. They’ll also work for a pack meeting where the theme is Courteous. A good gathering activity for your pack meeting on being courteous could be this manners search-a-word courtesy of Free Manners Lesson. The link on their page is for a Word document which I converted to a pdf document. One way to introduce some good manners to the boys is with a game of charades. 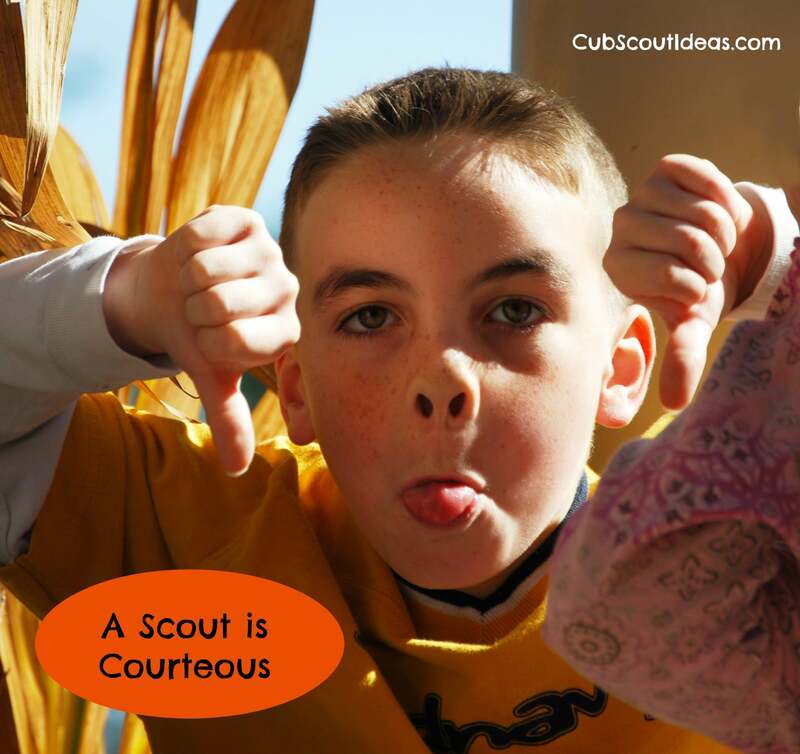 Recruit a couple of parents to act out examples of either good and bad manners, and have the Cub Scouts guess the manner and write it down on a piece of paper. When you have 8 or 10 on the list, let the boys select 5 that they want to include on their posters. If you need some ideas, here’s a list that will help you get started. Hold the door for the next person. Don’t let it slam in their face! Don’t hit or kick other people. Wipe your mouth on a napkin, not on your sleeves. Don’t tip back in your chair. Don’t stand too close to other people. When eating at a table, remain seated. Use “please” and “thank you” when asking for something. Don’t interrupt grown-ups who are talking unless it’s an emergency. I found a fun activity in this video for teaching kids the proper way to make introductions. Using craft sticks and pictures cut out of magazines, your boys can practice this important skill. For real-life practice, consider inviting your Cubmaster to your den meeting. The boys can introduce the Cubmaster to each other. Finish up your pack meeting by having the boys write a thank you note. Thanking someone for an action rather than a gift would be a great lesson to learn. Here are some ideas for you. If you have younger siblings at the meeting, use this fun manners mini book to keep them involved with a more age-appropriate activity. The book would also be great for Tigers. One good way for our children to grow up to be well-mannered adults is for them to see us practicing good manners. So, let’s make manners a part of our lives every day–not just an activity at a pack meeting. P.S. I ran across Dude, That’s Rude! (Get Some Manners) on Amazon that I’m going to order for my guys. 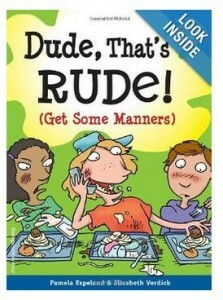 It has some great reviews and looks like a fun way to keep the good manners habit even when your sons are a little older. If you want to order the book and use the links here, I’ll earn a small commission (at no additional cost to you). Thank you in advance if you do!